As secretary of state, Baker worked to create a coalition of countries. 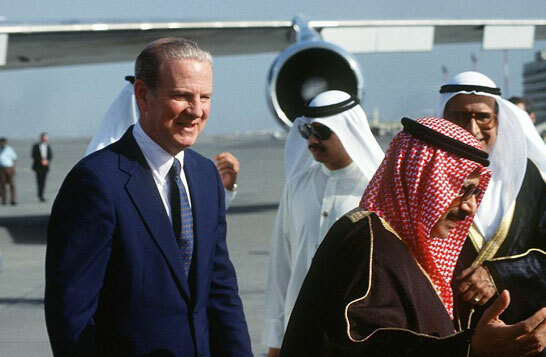 Students will examine historical examples of United States’ coalition building under Secretary of State James Baker. They will identify why coalition building was necessary and examine the major steps taken in achieving a coalition. Students will then identify a local problem or issue and analyze the actions needed in creating a coalition to achieve their goal. Part I: What is a Coalition? Facilitate a discussion with the students to interpret and evaluate the quotation. Draw upon students’ background knowledge. What is a coalition? What does it mean to build a coalition? Show the following two video clips as examples of United States coalition building that was led by Secretary of State Baker under the George Bush administration. As you show the clips, facilitate a discussion about each, having students complete the graphic organizers as noted for each clip. What actions did the different countries take that led to a coalition? Why were these countries opposed to German reunification? Why was it important to have the support of all of these countries? Why was it important to get support for Kuwait from these countries? What might have happened without that support? 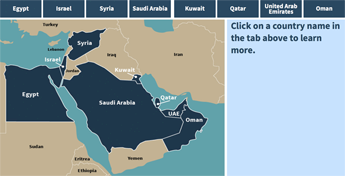 Use the interactive map of the Middle East on the student activity page to show students the physical proximity of the players in the coalition building efforts. Have them explore the map by clicking on a country to get more information. Introduce the educational activity by explaining that coalition building is necessary at an individual level as well as the global level. Explain to students that they will identify a school- or community- based issue and apply the steps of coalition building in order to develop a solution. Collect non-purchased cafeteria food and make food donations to a local homeless shelter. Begin a recycling program at school. Make food donations to a local homeless shelter. Run a clothing drive for the less fortunate. Create an after-school homework help center. Establish a BYOD (Bring Your Own Device) policy that allows student to bring their own electronics to school to assist them with their school work. The teacher facilitates a classroom discussion to narrow down the issues students believe are the most important. Depending on the size of the class, the number of issues should allow the class to divide into small groups of 4 - 5 students. Students form groups based on their issue. Not every student will be working with their first choice. The teacher reinforces students’ understanding of coalition building, and uses the examples from the Baker video clips already identified. The teacher facilitates a discussion about what may have happened in Kuwait without the coalition building. The teacher explains that the identification of supporters and opponents is a necessary first step in coalition building. Winning over the opponents to your point of view makes achieving your goal more likely. The teacher may wish to model an example. Use Building a Local Coalition – Example as a guide. Students work in groups to complete Graphic Organizer #3 – Building a Local Coalition . Describe what it means to build a coalition. Describe James Baker’s role as a “coalition builder” during two key events in history. Brainstorm alternative historical outcomes for what might have happened without the support of a coalition. Identify the differences between global and local coalition building. D2.His.1.9-12 - Evaluate how historical events and developments were shaped by unique circumstances of time and place as well as broader historical context. D2.His.3.9-12 - Use questions generated about individuals and groups to assess how the significance of their actions changes over time and is shaped by historical context. D2.His.5.9-12 - Analyze how historical contexts shaped and continue to shape people's perspectives. D4.2.9-12 - Use writing, visualizing, and speaking to construct explanations using sound reasoning, correct sequence, examples, and details with significant and pertinent information and data, while acknowledging the strengths and weaknesses of the explanation given its purpose. D4.7.9-12. - Use writing, visualizing, and speaking to assess options for individual and collective action to address local, regional, and global problems by engaging in self-reflection, strategy identification, and complex causal reasoning. D4.8.9-12 - Use writing, visualizing, and speaking to apply a range of deliberative and democratic strategies and procedures to make decisions and take action in their classrooms, schools, and out-of-school civic contexts. D2.Civ.9-12 - Apply virtues and democratic principles when working with others. D.2.Civ.9.9-12 - Use appropriate deliberative processes in multiple settings. D2.Civ.10-9-12 - Analyze the appropriate roles of personal interests and perspectives on the application of civic virtues, democratic principles, constitutional rights, and human rights. D2.Civ.13.9-12 - Evaluate public policies in terms of intended and unintended outcomes, and related consequences. D2.Econ.1.9-12 - Analyze how incentives influence choices that may result in policies with a range of costs and benefits for different groups.